I’m really enjoying my face challenge. My reference image was from many moons ago. Hope you enjoy the sketch! Happy Sunday, and peace to you. Thanks so much, Julie! Glad you enjoyed it! That one was easy. Well done! John, you’re very kind. Thank you! Thank you Sabiscuit! Peace and pigment to you! Thanks, Rebecca, yes this is from an old photo, I’m sure. Although he’s aged very well! So glad you enjoyed it! Totally Paul McCartney! GREAT sketch Laura! The eyes – those distinctive eyes – the mouth – the shading. Simply exquisite! Happy Sunday! Draw away! Ah Laura! This face is good – and easy to recognise! Thank you so much! I appreciate your encouragement! Very easy to recognize. Good job! Thanks so much, Teri! Glad you enjoyed it! Round here we get lots of these. I know to my expense. A friend of mine convinced me to put some paintings into the Liverpool Academy of Arts exhibition. She said paint some of the Beatles as they do well with tourists. I took her advice and did one of Lennon and one of Macca in Pastels- I was quite pleased with them . When I got to the exhibition the place was full of them – competition was stiff. They didn’t sell. In the end I gave them away. I’m sorry to hear that, Graham. Although their faces do beg to be painted! Is the one of Lennon on your website? If so, I loved it! Yeah, the Lennon on my website was one of them influenced by Harley Brown (worth looking up if you haven’t seen his work). The one of Macca wasn’t as powerful. Oh my gosh, I can’t even imagine. Wow, thanks for sharing! And I’ll have to check that artist out. I am so bad at recognizing faces that I’m always afraid to guess…but it does look like a young Paul McCartney to me. I think you’re a great guesser, Kathy! You nailed it! Thanks! Thanks so much, Jean and you are right! It just flies faster the older we get. Thanks so much, Nancy! I appreciate your visit and comment! Paul McCartney, right? Good sketch, Laura. You got it, Kirk! Thanks, my friend! Glad you enjoyed! Lance, you are too kind, my friend! And you’ve made my morning with your wonderful comment. Thank you, sir! I know who this is (pm). Have a wonderful Sunday Laura! Super drawing. Thanks so much, Sharon! I’m so glad you see him! I hope you had a terrific weekend! Thanks, Meow! (If you’d rather I call you something different, let me know. 😀) Glad you enjoyed it! I drew him four times and each time got something different. I’d like to draw him from a more current photo but it’d be more challenging. Learned that from Anthony Hopkins! Ha! My name is Rachel, but Meow certainly suits me just fine! Your Anthony Hopkins was great, though! I definitely look forward to your sketches each day! Not having a drawing bone in my body, I love see other people’s talent and art! Wow, that’s amazing! My husband (who is an artist) would probably agree with you, but I just think some people do have a natural knack for drawing. It’s probably also motivation and desire. But hearing your story is definitely inspiring! Yay! Motivation and desire – I probably have double helpings of each. I’m sure that plays a role. But practice will make anyone better at anything and I do draw daily. Nice that your husband is an artist! Lucky you! Oh great likeness! He really hasn’t changed all that much has he? Your faces of people and animals are so good. Once again Laura, awesome job! And it was all about the eyes for guessing who it is. Great sketch Laura. He has lost a bit of chop around the face since he went vegan and spent more time in the Scottish highlands. Thanks so much, Denis!! I may try him from a more current photo. Love his face!! Oh come ON?!!! This is dead on!! Lol Anyone would be able to tell from a tiny thumbnail who this is!! Excellent Laura!! ❤️😃 You’re awesome and never doubt it sis! Charlie, you are seriously the best bro ever!!! Oh this made me laugh! You are hilarious, love ya pal!! 😘😘😘👍👏 Thank you, friend! Mine too, Jenny! Love him! Thanks so much, I’m so glad you enjoyed it! Nicely done. You’re getting better at this…the faces are easier to identify! Thanks, Frank! That’s the goal, we’ll see what happens. Appreciate your encouragement! I’m so glad you recognized him. Thank you. I’d like to eventually draw them all. Hub and daughter love the Beatles! I love the Beatles too, the rest of my family not so much. In fact, I like them more now probably than back then. It holds up well. True. Some of their songs…..just never get old. Ahh love this one, dear Paul! Thanks, dear Cathe, so glad you see him there! Thanks for your kind feedback. Who doesn’t enjoy the Beatles? Lovely rendition of Paul and I recognized him right away, but in my heart I will always be a Monkees girl 🙂 Hey, hey! Lol thanks, Carol! Glad you saw him and enjoyed! John and it looks great – nice portrait, you even caught the gleam in his eye. Thanks, Mary! So glad you liked it! You got it! Thanks C! I love the Beatles! 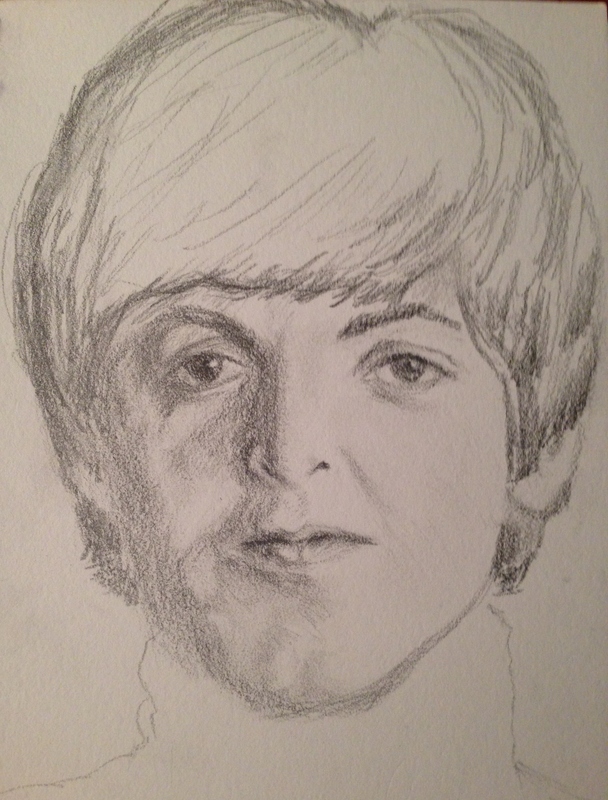 Exelent drawing of Paul McCartney! Thanks, Dennis! I’m so glad you like it! He was always my favorite. Fabulous job!